Under its founder’s influence, the early Wharton School faculty was known for its advocacy of economic protectionism, an influential group within the larger Philadelphia School of Political Economy. 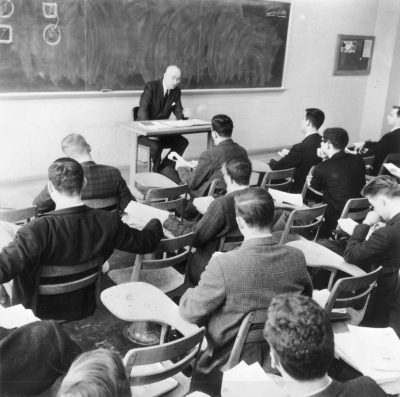 Since the founding of the School, the newly developing social sciences were incorporated into the Wharton curriculum, with Reverend Robert Ellis Thompson teaching a common Wharton undergraduate curriculum that consisted almost entirely of the social sciences. Between 1895 and 1915, however, Edmund James established at Wharton an unsurpassed curriculum of business of all sorts, teaching the new fields of finance and management just as they were developing. 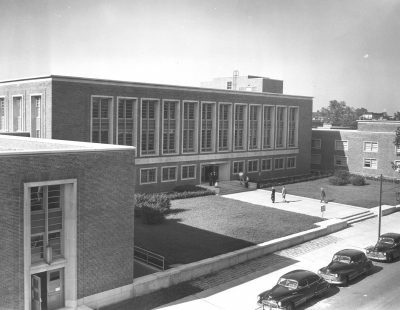 Wharton thus quickly overcame its initial reputation as bunch of academic “misfits” and the business school in Logan Hall started churning out graduates who would almost immediately become prominent businessmen in Philadelphia and beyond. In a University which had, for a century and a half, been a center of theory in liberal arts, the new Wharton School quickly proved the power of the pragmatics, and brought Benjamin Franklin‘s dream of the most practical school to a height Franklin never envisioned. Advancing into a graduate curriculum, Wharton began awarding MBAs in 1921 as the School rose to become a prominent national center of industrial research. In 1952 Wharton finally got its own home in Dietrich Hall, named after D. Wellington Dietrich, uncle of Wharton alumni and donors H. Richard and Daniel W. Dietrich. But a more drastic change was made a few years later, in 1959, when the undergraduate program was reinvigorated with radical reform and the liberal arts education was doubled to almost half of the curriculum, thus giving rise to the modern Wharton School curriculum. With this renewed academic orientation and the moving of the social sciences to the School of Arts and Sciences in 1975, Wharton has since been able to concentrate on what it has always excelled in, and what it was founded to do: giving students an unrivaled business education.